It was a blustery winter day. Every so often a shaft of sunlight penetrated the grey sky but I could see mist hanging over the Long Mynd. As I neared the summit of Caer Caradoc, I saw the raven. He flew over a rocky outcrop, making the characteristic deep ‘cronk cronk’ call. These birds are very agile in flight and, for a split second, he flips over and is flying upside down. This is characteristic territory marking behaviour. Ravens used to be widespread across Shropshire. They were persecuted by gamekeepers almost to the point of extinction. In the 19th century the population of ravens in the county numbered a mere three pairs. The population has since grown but the most likely place to see them is over the Shropshire hills. The uplands have become their refuge. Caer Caradoc is the highest of the Stretton hills. This range of hills lies on the other side of Church Stretton to the Long Mynd. Ragleth Hill and the Lawley are also part of the Stretton hills. Whilst the summit of some hills is little more than a slight rise on an upland plateau, Caer Caradoc rises steeply on all sides . The steep grassy slopes must have been an excellent deterrent to would-be invaders attacking the Iron Age hill fort located at the summit. The shapely curves surely make Caradoc the lady of the Shropshire hills. I walk the ramparts of the hill fort. They are now nothing more than grassy ridges but I try to imagine the scene in battle: I hide behind the rampart walls as invaders storm up the slopes. There is a clash of steel and blood spills onto the ground. The ravens circle overhead, waiting to feast on the dead bodies. Today the summit is peaceful. The wind has blown away the mist and the sun is now shining. I suddenly realise that I am looking down on a raven as he flies close to the ground about 30 feet below me. The sunshine reflects off his black feathers and he seems to sparkle. The hill fort has gone, the ravens remain. The raven lands on a grassy knoll and I focus on him with my binoculars. He is a sturdy bird with a powerful beak. In flight they have a wingspan as large as a buzzard and a distinctive diamond-shaped tail. Few species of bird are more steeped in myth and folklore than the raven. 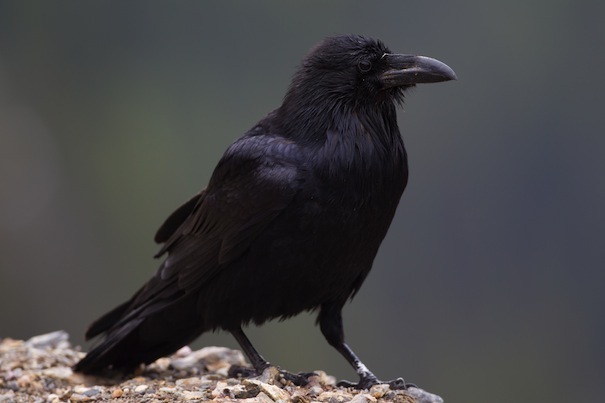 Because of their black plumage and the fact that they eat carrion, ravens are often associated with death and ill omen. A group of ravens is known as an ‘unkindness’ and in Sweden they are believed to be the spirits of the dead. If a raven is seen circling above a house in Scotland, it is said to predict the death of someone within. They are often associated with the devil. Ravens are in fact very clever birds. They are corvids and belong to the same family as crows, jackdaws, magpies and jays. Corvids have the highest brain to body weight ratio of all the bird groups. 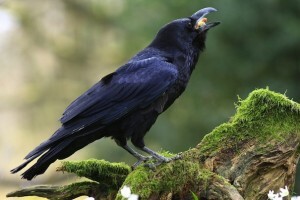 Ravens have been observed making toys from twigs to ‘play with’. They have also been filmed sliding down a snowy slope, seemingly for fun. One of the most amazing examples of the intelligence of ravens is the belief that they will deliberately reveal the location of deer to wolves. Ravens know that when the wolves make a kill, they will be able to feed on the entrails. Some modern deer stalkers have even reported that ravens guide them to the location of deer in the hills. Ravens are one of the first birds to begin nesting. They can be seen marking their territory and doing impressive mating flights throughout January and February. All Shropshire ravens nest at the top of large trees such as pines in an untidy nest. Often eggs are laid before the end of February. Ravens normally lay between 3 and 7 eggs but many young ravens die before they are 2 years old. A high number of breeding pairs is essential to ensure that the raven population continues to expand. Next time you are walking in the countryside around Church Stretton cast your eyes to the sky and look for the shadow of a raven, spirit of the Shropshire hills. Ravens with a coloured ring on their leg (indicating that the group have ringed the bird as a baby).